Create something special in your playground. We have a range we call Adventure Play which features exciting design concepts to make your commercial play area a real wow. Our Adventure Ships, Forts and Look Out Towers take the clubhouse system a stage further by building them into concepts and structures great for imagination play. They become exciting play installations which can absorb a large number of children playing at the same time and provide a striking centrepiece to any playground. In its simplest form this is a large (3.2m across) hexagonal tower with a huge play deck and of course multiple chances to add accessories. There are 6 walls so 6 opportunities to add climbing nets, rockwalls, slides or anything else which taks your fancy. You can also add a new dimension with a central mini turret which has a ladder going down to ground level and, like all our designs, this can be combined with other structures via connecting bridges and customised with a big choice of climbing features. From the mini to the mega here is a selection of Adventure Ships to create a real impression in the playground or any commercial play area. If you want a nautical theme – maybe your are near the sea or a river for example – children will love our Adventure Play Ships. With options such as a shade sail, slides, nets and climbing walls there are countless chances to get the right design for your space. Take four individual towers, join them together with bridges (with palisades below) then choose from the selection of accessories. 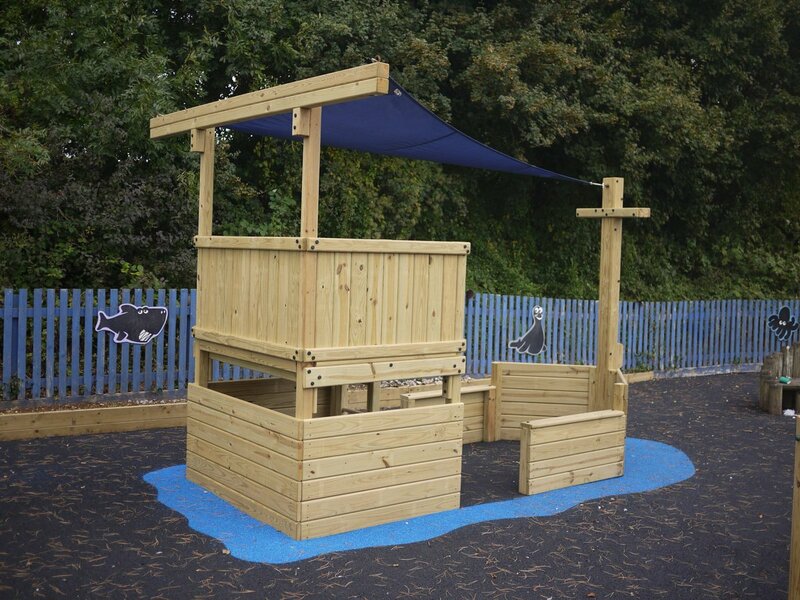 This is our Adventure Play Fort – a striking addition to any commercial play area. If you want, you can make the fort “impregnable” by limiting the access points to the inside; or you can spread the footprint and therefore the number of children who can play on it. Then you add slides and ramps etc to the outside. All our Adventure Play designs offer great scope for customisation so we can create a bespoke playground for you. The designs are highly adaptable and capable of really inspiring children’s imaginations: the adventure play piece becomes a wonderful focus for creativity and role play. Please have a look at our range of accessories here. I was very impressed by the (very patient!) help and advice and general attention to detail you gave me me when planning the correct system for my needs pre-sales, and by the speed and efficiency of the installation itself. The climbing frame makes an attractive addition to the garden and is also extremely solid and durable, and I would unhesitatingly recommend your company to anyone thinking of getting play equipment.